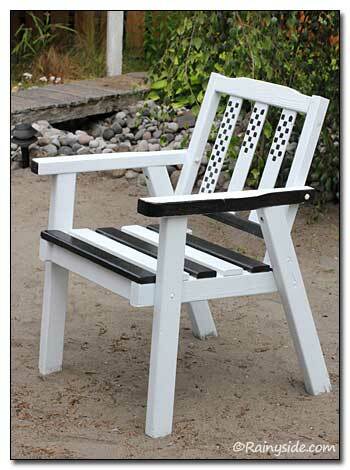 I want to be a bit cheeky and show you a few great sitting areas in Long Beach Peninsula gardens. While touring these gardens at the beach I found fun little elements that spoke about the character of each garden I visited. I believe every garden needs a spot for one sit a while. A garden without at least one place to plant oneself is something I don't understand. I've toured beautiful gardens with skinny little paths that make you want to rush instead of stroll, with no benches at all! Although these gardens were beautiful, they lacked this important element—a place to breathe. The following gardens had some fun, quirky, or beautiful seating, features that complement the garden as well as give it a relaxing feel. 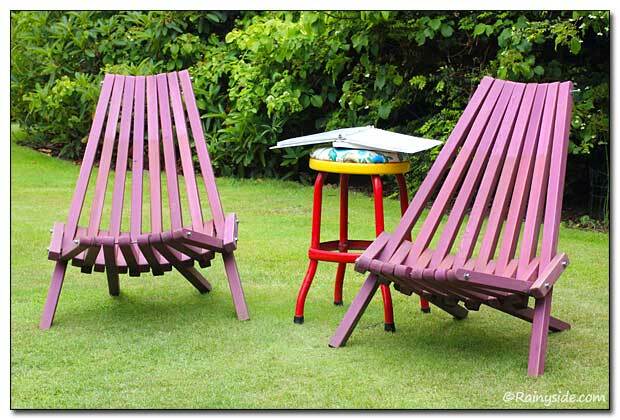 The paint used on much of them makes the seating even more extraordinary and just plain fun and unusual ways to plant your tush! 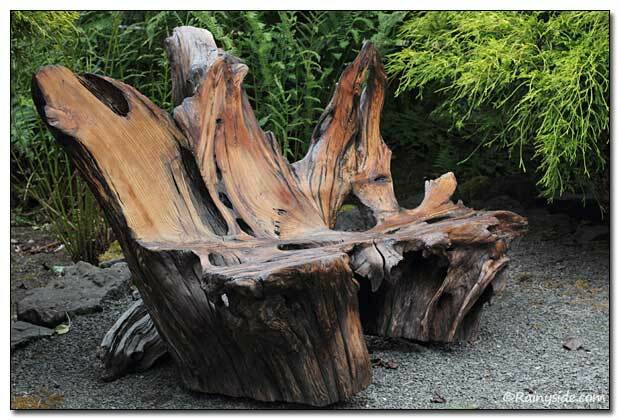 In Patti Jacobsen's garden, this beautiful driftwood bench came to her after it was dug out of the sand. She finished it with linseed oil and now enjoys nature's art in her garden. 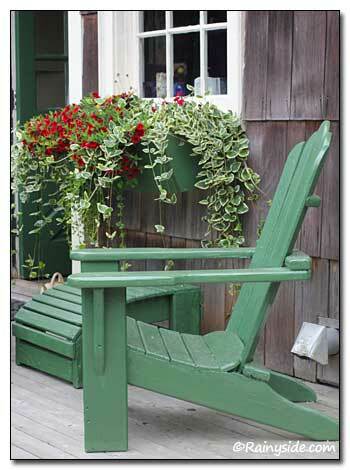 Other seating in Patti Jacobsen's garden includes a pair of luscious green painted Adirondack chairs sitting on her deck outside her back door. 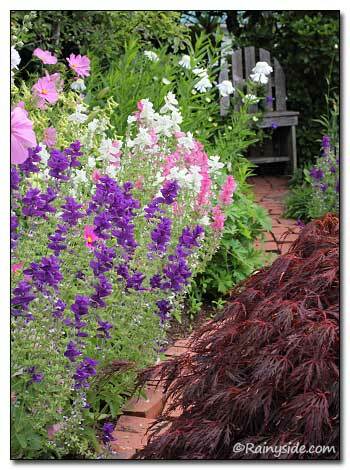 The planters and trim echo the same colors making this a restful spot to plant you into the scene. 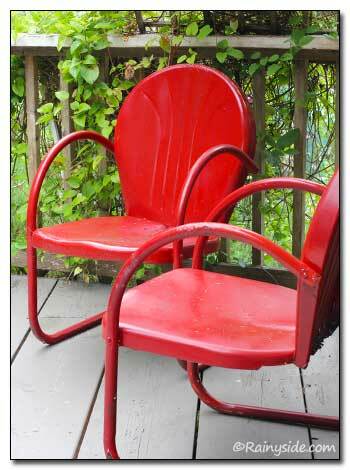 These vividly painted, vintage chairs are handsome sitting on a deck at the Painted Lady Lavender Farm. Outside the Andersen RV Park office is this sweet pink bench flanked by pots overflowing with yellow daisies (Agyranthemum 'Butterfly'). At the Pink Poppy Farm this pair of purple chairs greet you as you walk towards the gardens. If they had been for sale, I might have snatched them up! 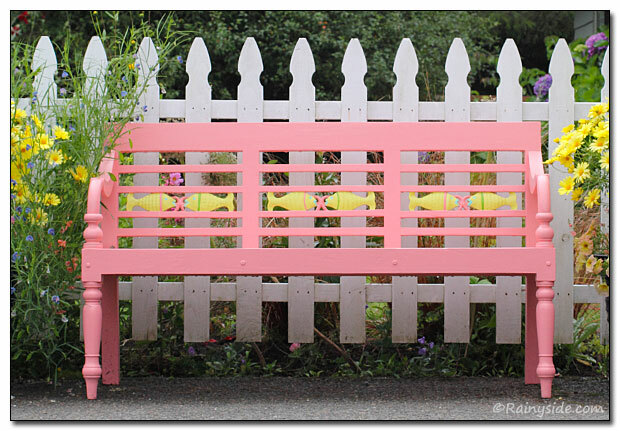 There is nothing like a classic styled bench at the end of a shady path to beckon you to come sit awhile and breathe in the air around you at the Klipsan Beach Cottages. 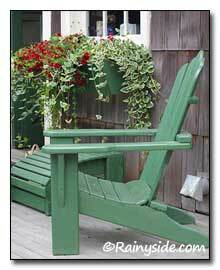 I loved this whimsical chair sitting in a sandy beach style area in Laura and Don Deemer's gardens. 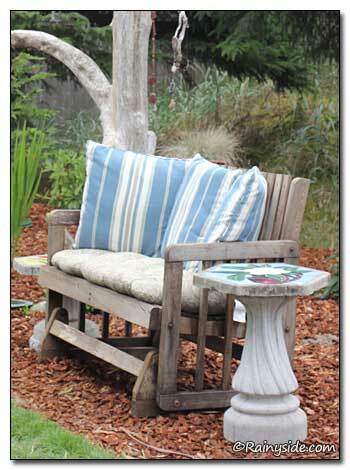 This beachside garden of Harvey and Dee Bristol looks great with a weathered glider bench and lovely cushions under a planted driftwood log. I wish I had taken a close-up of this charming chair at the end of a flowery path of brick at Jo and Bob Fitzsimmons’s garden. 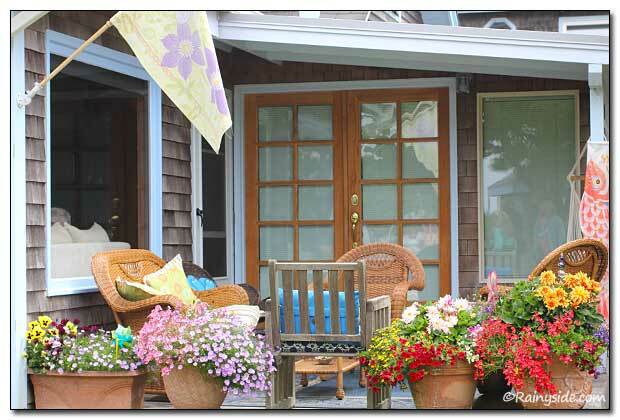 Wicker paired with brightly planted containers always creates a scrumptious and inviting area to sit, especially when relaxing at the Boreas Inn. 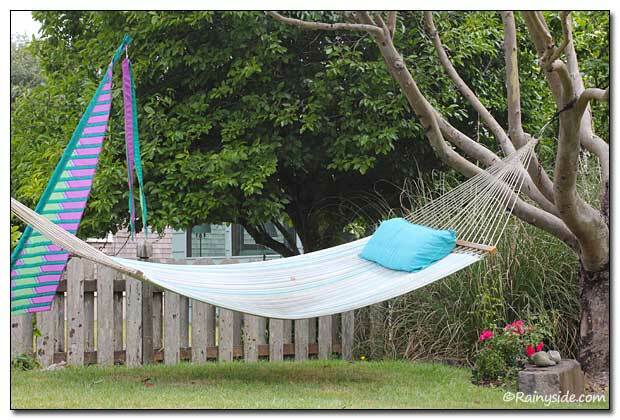 This hammock under a eucalyptus tree at the Boreas Inn is technically not seating, but it certainly speaks about lounging, which is after all what sitting in the garden is all about. It means taking the time to breathe and unwind. 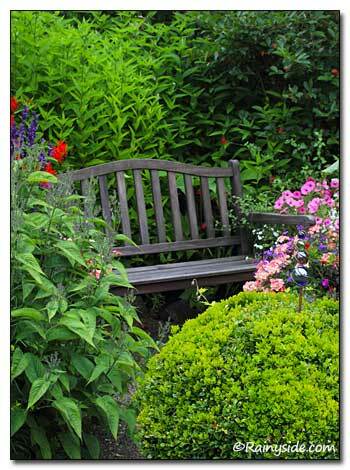 Don't forget to take time out in your own garden, just to breathe!